THANK YOU FOR MAKING OUR 2017 INSTALLATION & AWARDS LUNCHEON A SUCCESS! On behalf of our board and the students we serve, we want to say Thank You, for helping us make the Luncheon a wonderful success, as we honored amazing members of the community. Your generosity will enable us to award scholarships on May 18, 2017, to outstanding Latino high school and college students in our community. Without YOU none of this would be possible. 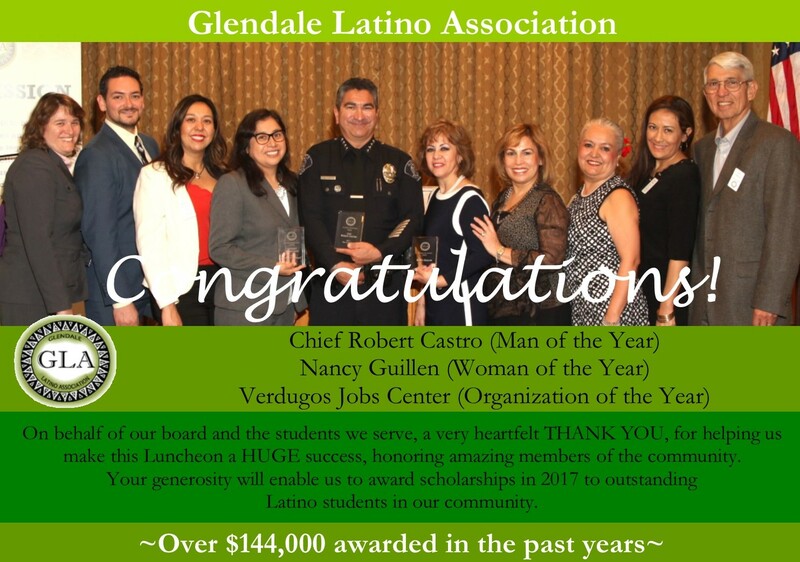 Congratulations to Chief Robert Castro (Man of the Year), Nancy Guillen (Woman of the Year) and Verdugo Jobs Center (Business of the Year). THANK YOU TO OUR SPONSORS! GLA thanks our Sponsors for their enduring support of our work in our community.